I have a confession to make. I’ve been holding out on you. There’s a room in my house that I’ve been quietly working on since March, but I haven’t shared it with you. I know, and I am sorry. I really didn’t mean for this to happen. It started out innocently enough, but one thing lead to another and well, we’ve made some pretty significant progress on the master bedroom. I know. I feel really badly. At some point since I made this board, I had decided that I liked the color Normandy better than the Providence Blue color that I used on the board. But since I had had such a hard time with the grey for the stairway, I was nervous that I wouldn’t like it on the wall and just wanted to go ahead and see if it would work so I could start mentally working on that room. I put the sample on the wall and immediately loved it. I moved forward with the guest room project knowing that I had my jumping off point for the master bedroom whenever I was ready to proceed. But as I thought about that room in my head over the next several months, I still struggled with how to move it forward. So I put off painting the room in the hopes that some decorating brilliance would come to me and I would know what else I wanted to do in there. To remind you of what the room looked like, here are some photos from a few years ago. This room has two large dressers, two night stands and a king size bed and it still felt sparsely furnished. That’s because it’s a big space (15’x17′) which is part of the reason why I was having so much trouble figuring out how to properly decorate it. In the years since these photos were taken, we added a desk that didn’t work out, swapped the night stands for some end tables that came from my mom when she sold her house and got a new duvet. Then, one day in April I just decided to take the plunge and paint the room. I had the time and was sick of looking at the beige walls. After another painfully long and cold winter, I needed a change. Now I wish that I hadn’t waited so long, I absolutely love it! After the paint had dried, I suddenly started having a vision for the space. I went into Target one day and saw the yellow lamp you can see in the photo above and brought home two of them to see if they would work and I loved how they looked against the deep blue wall. I am so glad I snapped them up when I did because Target appears to have stopped selling them already. I can no longer find them on their website and I haven’t seen them in stores in a couple of months. I really meant to do a post just on the paint and the lamps, but the kitchen reno got started not soon after and we all know that took longer than expected and so before I knew it the room was half finished and I hadn’t even mentioned that I had started. When the faucet for the kitchen arrived, the box contained a coupon for $30 off any Home Decorator’s Collection product so I used that to replace the the old, vinyl blinds with new faux wood ones like we did in the guest room. Then I added this bench from Target under the window. Things were starting to come together. As I mentioned earlier, I had put a small, white parsons desk in one corner about a year ago thinking that I might use it to work from home on the few days that I do that, but over the winter I realized that that corner is a very cold spot in the house and that the table in the sun room is really where I like to work when I am at home. Plus the desk didn’t fit the space proportionally and always looked funny to me. It was a decorating fail for sure. I had been keeping my eyes open for an inexpensive chair that I could replace the desk with. Since I figured that any piece of furniture in that space would rarely receive use by a human, I didn’t want to spend very much money. Then one day in June I think, I saw this chair from Wayfair.com. The price was right, the style was right. It was the perfect option, so I swooped it up. The throw was a random Home Goods purchase. It’s Cynthia Rowley Home. The nightstands are the aforementioned hand-me-downs from my mom. I sanded them lightly and then hit them with one coat of primer and two coats of BM’s Simply White in their Advance paint that is great for furniture. Before I sanded I painted, I also removed the old hardware and filled the holes with wood filler. Once it was dry, I drilled new holes and added the new hardware, which I got at the same time that I ordered the hardware for the kitchen. The mirror above the bed is this one from Target. I sprayed it silver to match the room. It doesn’t pop on the wall as much as I would like it to, so I think at some point I may prime it with white primer and then go back over it with the silver in the hopes that it might look a bit more platinum and contrast with the wall a bit more. The rug is actually re-purposed from the living room. Long story. different day, but that room is up next on my to re-do list. We’re not quite done in here, however. I have been on the hunt for the right curtains and have come up empty, so I think I may make my own. 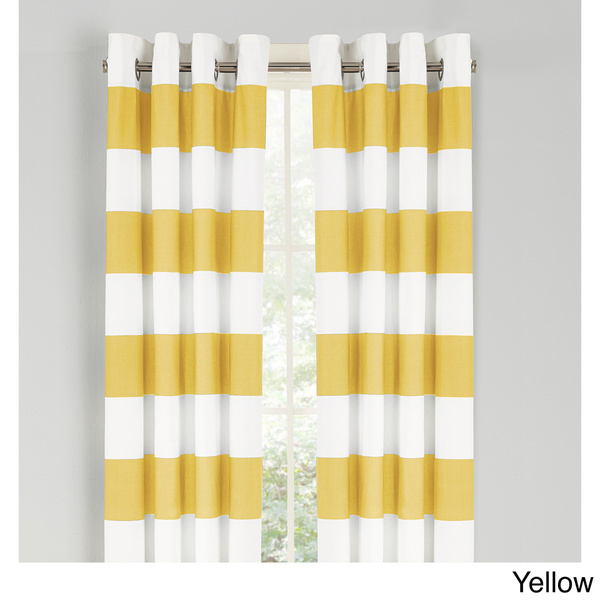 I would like a wide, horizontal stripe like these ones from Nautica, but the yellow is too bright and doesn’t match the lamps enough. I haven’t been able to find exactly what I am looking for and there are lots of tutorials online about how to make your own striped curtains so I think I may go that route. The other issue is the dressers. The dresser with the TV “conveyed” with my first apartment in Hawaii. And by “conveyed” I mean that the previous tenants just left it, which was great for me because it’s a nice color and well-made, but it’s not in the best shape. The shorter dresser was a $99 Craigslist purchase simply because we needed more storage and it fit the space. It’s missing some handles and not in the best shape either so I still trying to decide whether I should try and work with either of these or start over. We also desperately need to replace the ceiling fan. The ceilings upstairs are not quite 8′ high though so there’s not alot of good options. All of the semi-decent looking (for a ceiling fan) lighted flush mount options have blades that are actually lower that the ones on the model we currently have, and I already have to be careful not to raise my arms too high when I am making the bed. I would like to forgo the fan and just do a flush mount ceiling light, but Mark thinks we need the fan, so we’re still negotiating. Even with these outstanding issues, I think that we can all agree that the room looks much better now than it did a few months ago. I am sorry for holding out on you guys on this one, but I hope that you like where we’re going in here. 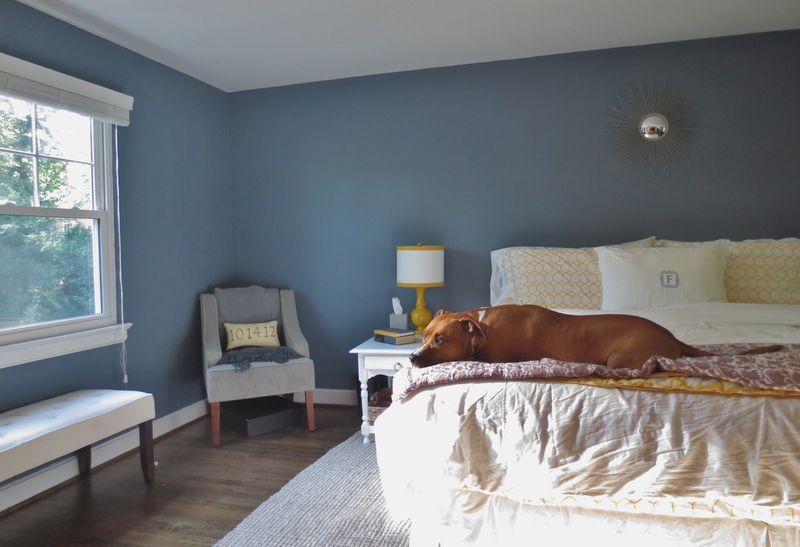 The wall color alone really has made all the difference, so if you’ve been thinking of changing up the paint in one or more of your rooms DO IT! It’s the fastest, cheapest way to make a fresh start. Boy, you were right about that color blue. It is stunning and perfect for a guest bedroom. Love the doggie sleeping on the bed touch. Make it your signature to have a dog in all your final reveals then people can say, Ah! That’s a Cynthia Rowley Home. ;). I love the angles of that room. It must have been fun to work on and it looks fairly large. If it was in my house someone would have snatched it up for a home office or craft room! We have two home offices and one craft as it is. Anyway, I really love how you pull all these disparate pieces together, sourcing them from places like Target (which really has some gems sometimes), Craigslist, etc. 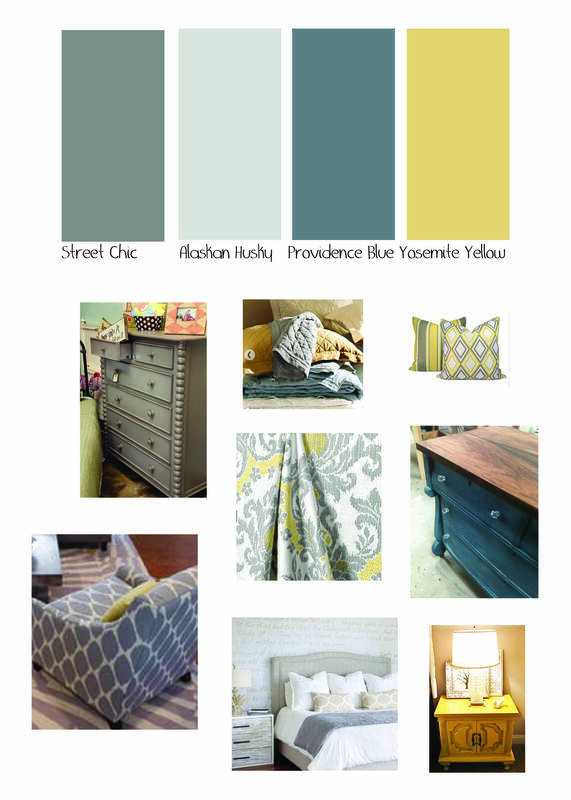 I love those stores, plus Ballard Designs, Country Curtains, and Home Decorators Collection. Plus my absolute favorite, Grandin Road. Great prices there! Keep up the great work. I love to read your blog and see how you all are progressing. It keeps me going on our house, too!